I am looking down at myself and I am dirty. Filthy, actually. I have dirt under my nails, in my ears, between my toes. I look like I haven't showered in days. And I break out in a giddy smile. I'm happy. 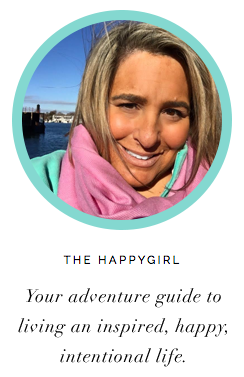 When I started this Happy Girl Experiment I wondered "Would I would ever get my happy back?" And if so, how exactly was I going to do it? Over the past few months I have tried a few different things: positive change books, talk talk talking about my feelings, happy music but I never thought about getting dirty until I ate a bit of salsa, the perfect cool cilantro hitting my palate dead on with the summery bright tomato mixed with a hint of garlic and a jolt of lime. I wanted more. I wanted to make my own and then it hit me, I would grow salsa. I told L. my plan at dinner one night not long ago. Scooping some Whole Foods salsa onto an enchilada for L., I told him I was going to grow salsa. My husband looked at my with his head tilted. "You know it doesn't grow that way right?" Indignant I said "I'm aware that it doesn't GROW like that but I want to grow our own so maybe tomatoes, onions, cilantro, garlic. We're going to have a garden!" I was excited. I can't remember the last time I did something physical. My job was not physical. I sat at my computer, went to meetings, got on a plane, did my job somewhere in the world and flew home. I wasn't physical. I realized I didn't spend much time exerting myself. I needed to do something that proved I still had strength, that this past year hadn't killed me. I hit the home improvement store, bought plants and seeds, soil, a shovel and a big bag of manure. I was ready to plant salsa. What I didn't count on was how HARD it was. 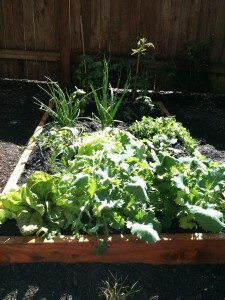 I had some help from our lawn guy who saw what I was trying to do and made me a little raised garden bed. OK, now it's easy right? No, not easy. It was sweaty work, digging and hauling and planting. But I got all the plants in one lovely afternoon-tomatos, onion, cilantro and as a bonus, lettuce and basil. It was hot, hard, muscle wrenching work. I was sweaty and dirty and I loved it. When you work your body hard it does something to your head. You feel accomplished. It proves that you are still very much alive. After losing the babies in December I hated my body and the way that it had betrayed me. I felt disconnected with my body, I was destroying it with my devil may care behavior. Something changed in me though when I was hot, sweaty and covered in dirt that first afternoon in the garden. It felt like every muscle was working with me to accomplish something. I wiped the sweat from my forehead and looked behind me at our puppy who was stepping up on the raised bed and eating the basil leaves from the little starter plant. I laughed at her and she looked up, covered in as much dirt as me. I picked her up and she licked my cheek, her breath smelling very much like pesto. In this quest for happiness, one thing I learned is that you need to tune back into your body. Do something hard, plant a garden, remodel your backyard yourself, clean the garage, challenge your body to work with your mind. It's as though something fires between your neurons making the bond between your head and your body stronger. Suddenly you feel strong. Every time I go out into the backyard and watch our little salsa garden grow and pull weeds and tie up the strong tomato plants reaching for the sky, I feel a sense of accomplishment. 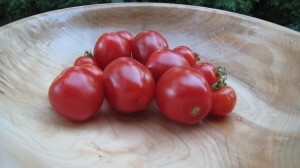 And when I pluck one of the still warm from the sun cherry tomatoes from the vine and pop it in my mouth I taste summer and hard work. So, yes, I am dirty but I don't think there is any better solution for curing what ails you then getting out there and working yourself hard. Really hard. Get dirty. Don't stand on the sidelines. Dig in. Then take a cool shower and watch all the dirt swirl away down the drain. I took a cool shower and I could swear that it wasn't just dirt that I was shedding, but all that bad stuff that I was holding onto.